Managed to make it on up to the Pohopoco over the weekend to chase some coldwater species. We hit the stretch below the dam, but not immediately below the dam. Overall the fishing was decent, but all the fish landed were on the small side. This piece of water does get hammer by the hook 'n cook crowd, so the lack of larger fish is not all that surprising. What we did catch was a lot of small wild browns - - which for the most part were relatively active despite the recent bit of scorching heat. Insect actively was also not to shabby either (hence the reason for the active trout), for mid-summer. From about 9:30-11am there were some olive mayflies (size 16-18) hatching here and there, which got the fish looking up. A dropper off the dry managed to get a handful too. Either the nitro or the ultimate did the trick subsurface. A elk hair caddis or an olive cdc dry did the damage on top. Water release from the dam was about 50cfs, and the discharge temp was about 57F. Down in the area we were fishing, the water temp was 60-62F. As reference back in late-June the Po has been running 5-9F warmer than usual.Welp, that has now changed. Someone must have said something to the Corps to make them drop the water temp coming out of Beltzville. You just don't drop 10F peak to trough overnight with out some sort of directive from the folks who are tasked with looking over our state's aquatic resources. This sort of action and cooperation on the part of the Corps is a welcome sight. Right now, the Lehigh is running very warm, and any thermal protection help the Lehigh trout can get is very much appreciated. 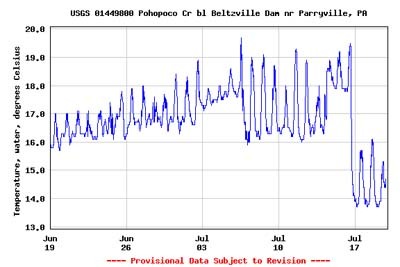 Remember we are just not talking about stocked trout in this stretch immdiately below the Po, but also wild trout, as well as quite a few of the PFBC fingerlings. 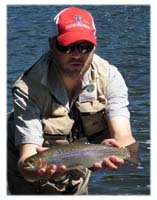 So the PFBC has a vested interest that their trout weather this hot spell as best they can. With that being the case, some additional cold water seems like a no-brainer. I mean it ain't doing much good to horde it all in the Reservoir. Some parts of the state have received a bit of welcomed rain. Down in the SE the rains arrived in torrents over the weekend, and then once again early in the week. However, not everyone has been on the act. This goes to show the localized nature of the storms we are currently seeing. Fore instance, the NE part of the state and specifically the Poconos has not really seen much of anything. The upper Lehigh watershed has been spared for the most part. The headwaters are running at a half to a third of what they should be this time of year. While, at the bottom end of the watershed - around Allentown - Mother Nature has been very kind. Though it would be nice if she did spread out the duration of the events somewhat since there have been reports of flooding. At this point though we will take whatever it is we can get. 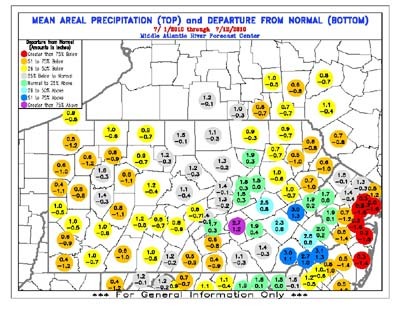 With more heat on the way heading into this weekend, lets hope some of the areas that have been spared get in on the action - - specifically the upper Lehigh watershed from say the Gorge up. We shall see. 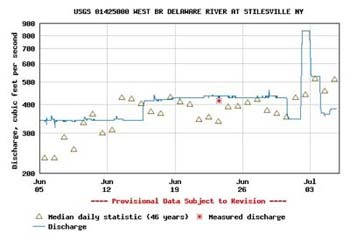 Heading into the long holiday weekend the releases were looking good on the West Branch of the D. The 800cfs + on Friday is enough cold water to cool the entire West Branch and even some of the Main Stem. So things were looking good! However, that whole event was one big pump fake since on Saturday the release was cut by about a third, and then on Sunday the release was cut even more! So much for a consistent release of coldwater. It is beyond me why they (the powers the be!) can't just average out the release and set the valve at the happy medium as opposed to pumping it up, and then shutting it off! I guess if this were the case, then human interpretation (ie., common sense!) of the data would be needed, and we don't want that. What a joke! Anyway, the fishing was fair. There are decent hatches of sulphurs way up toward the dam in the mid-day hours but other than that the fishing was rather slow. Also, the crowds are there due to the fact that everyone is crammed into a short section of the river. Hopefully with this heat on the way, the powers that be will see to it that some sort of conservation release is warranted. Otherwise the fish on the Upper D are gonna bake!